Eurocom Mobile Servers are now available for procurement by the US Federal Government through the Commercial and Government Entity Code assigned by the Department of Defense’s Defence Logistics Agency (DLA). The EUROCOM Panther 5SE Mobile Server is an all in one system that results in a compact 12 lbs, 16.76 x 11.44 x 2.31 inch mobile server solution. It is designed for world wide deployment and easy network set up. It is easy to transport, move around and relocate as it can fit into a single carrying bag because of its all in one, compact design – a perfect fit for mission critical assignments. The Eurocom Mobile Server is the building block of modern and mobile IT infrastructure because of its fast and easy deployment. Prepare a complete server setup at your location and then deliver and install it at a site without downtime associated with traditional servers. There is NO Server Room required to install our Mobile Servers so they can be used them whenever rapid deployment is required for both temporary and permanent usage. The EUROCOM Panther 5SE is an enterprise class system for professionals creating, studying and manipulating sensitive data, because of this security is essential, Eurocom equipped the Panther 5SE with a Trusted Platform Module 1.2 (TPM), finger print reader and Kensington lock port to provide them with the utmost in secure computing to keep their information, intellectual property and livelihood safe and secure. 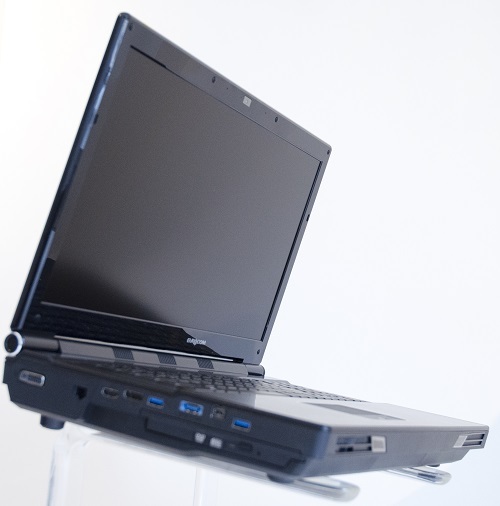 With such capability in a mobile form factor, with so much custom options the EUROCOM Panther 5SE can fulfill a wide range of applications. For network, storage and server managers like Gregory Carter, from Applied Engineering Software Group, the Panther combines the perfect combination of capability and mobility, as explained by Gregory himself. “The analytic, software development, infrastructure management work I do on the server, storage and network problems many of my customers have require simulation study. So I used to haul around a desktop class system and run many of my own tool sets for identifying customer problems in that machine. It became a pain to haul around 80 pounds of hear with me. When I saw an X79 chipset in a laptop that could run an Intel Xeon class server processor, I decided to have a look at the Panther 5SE. I found the machine could run all of the tool sets I use just as well as the desktop server machine I used to haul around.” Gregory Carter – AESGI. In addition to the Panther 5SE, Eurocom has a full line of Mobile Servers including the 15.6” P5 Pro SE to offer customers the exact Mobile Server solution they require for their mission. The EUROCOM P5 Pro SE3 has Intel® XEON E3-1200 v3 series support from an Intel Z97 Express Chipset and LGA 1150 socket. Memory is fully upgradeable and configurable with four SODIMM sockets able to support up to 32 GB of memory. The EUROCOM P5 Pro SE3 Mobile Server is an all in one system that results in a compact 7.5 lbs., 5.4x10.48x1.4 inch mobile server solution. It is designed for world wide deployment and easy network set up. It is easy to transport, move around and relocate as it can fit into a single carrying bag because of its all in one, compact design. The P5 Pro SE3 is prewired for 3G/4G module support, through an M.2 slot, so users can have a reliable internet connection on the go.